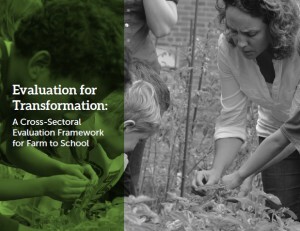 This is mostly the description on the NFSN’s website: Evaluation for Transformation defines the outcomes that farm to school has the potential to achieve and it offers common language, guidelines and metrics to understand those outcomes for the first time. The framework is organized around four key sectors: public health, community economic development, education and environmental quality. Beyond the four sectors, the framework is also structured around three levels of action: program, research and policy. Readers representing multiple stakeholders can use this framework as a guide to develop, describe, implement and conduct farm to school and farm to preschool activities and evaluations.